We’d love your help. Let us know what’s wrong with this preview of The Life You Left by Carmel Harrington. Now Sarah, I’m not coming home tonight. Edward is an angel. And he has a message for Sarah that will change her life and the lives of others forever. For it is only in the most difficult of times that Sarah can discover how strong she truly is. To ask other readers questions about The Life You Left, please sign up. Carmel Harrington, an Irish author, entranced my mind with her new novel, The Life You Left , that lets us see the world and life in an all new way by making us belief with the existence and beauty of guardian angels, premonitions and by dealing with some life-altering problems with a positive attitude. It started out like any other day for Sarah Lawler; getting the kids ready for school, making the pack lunches and juggling baby Ella's feeds. There was no way of knowing that her husband Paul would leave for work that morning and simply not come home. Now the questions are piling up quicker than the unpaid bills and Sarah is getting desperate. But it turns out she isn't quite as alone as she thought she was. When her beloved childhood friend Edward comes back into her life, Sarah thinks she's finally been thrown a life line. There's just one problem with Edward: Sarah is the only person who can see him. PS: I have not reviewed this book based on what I believe rather on what the author tried to make me believe. So this review is impartial of my personal belief and faith. Sarah is like any other regular mom- she has 3 kids and a boutique and her days revolve around taking care of her three children and has a husband who supports their household. All of a sudden, one day, Sarah's husband, Paul never returns back home from his office, while he emailed her to let her know that he is sick and he needs to get away from the chaos of his own family for few days. Thus begins the story of Sarah! Sarah is normal, but she has a guardian angel to protect her and also fills up her head with premonitions like death or suicide of some random people, where as her brother, James is a PI who happens to solves all those cases- yeah, I know they sound like Holmes and Watson and the only difference is that, Watson has the power/ability to see the future crimes and criminals. But when her husband abandoned them, Sarah's mind fills up with all kinds of doubts about her husband. Will she trust her premonitions or shall she trust her instinct that he will come back? Read this story to unlock this unraveling mystery about Sarah's husband. I thing I would like to say is that the story is immensely heart-breaking and the climax, simple left me in tears. If you're an emotional person like me, then I'm pretty sure this story will deeply touch you. This is not only about guardian angels and mysteries, but it is about life in simple- what happens when your husband abandons you and your children forever, what to do in this situation, what happens when your best friend comes back to your life, how does it feel to save a random person's life who holds no meaning to you, all these issues are explained by the author in a delicate and sensitive manner. The central theme would be how we see certain things in our own mind. Although the protagonist, Sarah is constantly bumped up with visions of some murder or death, but still the author leaves us enough space to see those premonitions in our own perspective. The story felt very surreal yet somehow it felt thoroughly striking. From the very first page itself, I got hooked on to the flawless story-telling of the author. Yet, the narrative style felt bit monotonous and sometimes very depressing. The idea of a guardian angel completely glued me till it's very end. There are also quite a lot of mysteries to be unlocked by us, which are described like any other mystery story- the only difference is that we knew who or what was the outcome, but it was quite intriguing to see how the author unraveled them layer-by-layer. The characters are very striking, which seems like the author drew inspiration from her every day characters. Moreover, the whole setting is very Irish. With this story, I got a slice of Ireland- it's culture and customs and talking standards. The whole Irish flair is very vivid in the author's tone of story-telling. Sarah, James and her kids will enthrall your mind and heart with their demeanor. After reading this book, I too wish to have a brother like James. Their strong bond of love depicted by the author is fantastic. In Sarah's hard times, James was always there like a pillar. Edward- the guardian angel- we see a lot of this 11 feet tall guy- I felt his demeanor to be very soothing enough to like him. Paul sounds like a confused husband, running away from his wife and life, but still he made me feel like he had warmth in his heart and due to his confused state he couldn't show it. Rita, Paul's mother is one hell of a woman, supporting her daughter-in-law in her each and every step, and is can be bit funny at times with her snarky remarks. Verdict: Contemporary fiction lovers will love this book, and for the rest, I would recommend you to read it to feel the warmth in the author's compassionate words! I feel a bit like I am in a parallel universe at the moment after reading this book. I have gone back and looked at all the 4 and 5 star reviews and wonder why I did not feel the same. Regardless, I just found this book lacking in a lot of areas. Sarah's husband has sent her an email saying he's leaving for a while leaving her to care for their children on her own with bills and debt up to her eyeballs. Enter "Edward" who is Sarah's guardian angel that she has been able to see since a child, she I feel a bit like I am in a parallel universe at the moment after reading this book. I have gone back and looked at all the 4 and 5 star reviews and wonder why I did not feel the same. Regardless, I just found this book lacking in a lot of areas. Sarah's husband has sent her an email saying he's leaving for a while leaving her to care for their children on her own with bills and debt up to her eyeballs. Enter "Edward" who is Sarah's guardian angel that she has been able to see since a child, she sees him, talks to him and listens to him. The style of writing in this novel I found very frustrating, bordering on annoying, for example Mary, who is Sarah's new friend calls her "pet" in just about every single conversation, it just gets really irritating to read it over and over again, especially more than once in the same conversation. I know it's a common term used in Ireland and other places, but I felt it was overdone and came across as cliched. I don't know about you but I found wording like this too cheesy for want of a better word (and note the exclamation mark, I am coming to that). 'How are you? You look tired. Is everything ok?' Sarah blurted out. 'Yeah, subtle! she thought. Way to go Sarah. And there is is again, the exclamation mark, want a bit more? Not sure I think that's fair.' Sarah moaned. 'There has to be at least one perk!' 'I agree!' Mary laughed. 'And I hate to break it to you, but the pay is rubbish and the holiday's non-existent!' Mary quipped. Let's count together, that's three in just one small brief conversation, it's like that all through the book. My eyes were rolling in my head. And there were quite a few moment of people "quipping" in this book. Overall I felt the plot should be good, but it was lost somehow, it didn't quite come off as well as it should. The whole guardian angel thing ended up just seeming really cheesy and corny. I was struggling so badly to like this book or love it like others had, but the faults (in my mind) in it are too great. There are things like Sarah is having a dinner party and at first it's stated that antipasti is being served in a "large bowl", in the next sentence it's on the table on a "platter". Miraculously it had jumped from the large bowl to a platter layout magically. And no, the guardian angel did not do it. I do not normal critique so harshly ever in my reviews, and I feel kind of bad that I am one of the few not so great reviews here for this book so far. I am sure many will love it. But I could not get past the over the top language, the excessive use of exclamation marks, the cheesy conversations, the over-familiar wording. I just could not enjoy this one unfortunately. Don't shoot the messenger. I always promise an honest review. I received a copy of this novel thanks to the publisher via NetGalley in exchange for an honest review. I can’t tell you how excited I was to read this book! After I’ve read Carmel’s debut novel Beyond Grace’s Rainbow I just knew that Carmel is a special and unique author. The story follows Sarah, a mum of three adorable children (Tommy, Katie and Ella) and wife to Paul. Paul just leaves out of the blue at the start of this novel, without saying a word. Why did he leave? And Sarah? Sarah is special, she can see an angel and dreams about real things that happen. The problem: Nobody believes her. Nobody except for her twin brother James. I fell in love with James instantly, such a great and supportive brother… And their relationship is just great! Sarah has to deal with a lot, there is Edward and nobody else can see him, now she has to take care of her three children alone and then Katie’s teacher dies. Sarah has weird dreams about that and together with James she tries to figure out with this is all about. They start investigating and thinking about the crime themselves. For the children there is a lot to take in with their father gone and a dead teacher. They’re not really able to understand everything yet. This story has everything: a mystery to solve, a woman going through problems in her marriage and trying to find love again, awesome supportive characters who are greatly involved and have their own little story to tell. It’s such an emotional, heart warming and touching read, I couldn’t put it down. Carmel developed some wonderful characters and Sarah impressed me with her strength, power and courage. Her children were so cute and I adored they way she was there for her children, these scene were so full of love and just so sweet. Edward fit in this story perfectly, being there for Sarah and helping her with her gift and all other things she had to go through. Anyone who even remotely knows me is aware of how overly-excited I’ve been for The Life You Left and Carmel Harrington yet again blew me away with this fabulous book. Right away this book captured my attention as we hear about a mysterious email sent to Sarah from her husband Paul, saying he wasn’t coming home that night. In what could have been an intriguing story on its own, The Life You Left had much more of an edge to it than that with the fascinating addition of Sarah’s guardian angel Edwar Anyone who even remotely knows me is aware of how overly-excited I’ve been for The Life You Left and Carmel Harrington yet again blew me away with this fabulous book. Right away this book captured my attention as we hear about a mysterious email sent to Sarah from her husband Paul, saying he wasn’t coming home that night. In what could have been an intriguing story on its own, The Life You Left had much more of an edge to it than that with the fascinating addition of Sarah’s guardian angel Edward. I loved this concept and the way it affected Sarah’s everyday life and I was always interested in Edward’s role as Sarah tried to rebuild her life and support her family. I also loved Carmel’s wonderful character development. Not only does she bring us a fab main character in Sarah, one who was really easy to like and empathise with, there’s a brilliant cast of supporting characters. Sarah’s brother James was my favourite supporting character – I loved his relationship with Sarah and how supportive he was of her. Carmel always writes side characters which you know would be capable of having a brilliant book themselves and I felt like that about Ruby and James amongst others. After a great start to this book, I loved how it just kept getting better. The Life You Left had everything – from family, love, protectiveness to more harder-hitting and sensitive issues. I really connected with Sarah in this novel and her wonderful, strong personality makes her probably my favourite leading character in any book I can remember reading. Her care for her family and even for people she doesn’t know all that much, plus the way she always picked herself back up and fought for the people she loved made her a really fantastic, inspirational character. I have been waiting very impatiently for The Life You Left and it definitely did not disappoint! Carmel packed plenty into this simply stunning novel and wrote it to perfection. Anyone who follows me on twitter will know of my absolute love for Beyond Grace's Rainbow, one of the most perfect books I have ever read. I loved every second of it. I have been eagerly anticipating the release of Carmel's second book 'The Life You Left' to see if she could produce another gem. If I'm honest I was a bit scared because I wasn't sure she could match her debut novel. I was wrong! The Life You Left is another award winner. I LOVED it! From the start I was unable to put it down unti Anyone who follows me on twitter will know of my absolute love for Beyond Grace's Rainbow, one of the most perfect books I have ever read. I loved every second of it. I have been eagerly anticipating the release of Carmel's second book 'The Life You Left' to see if she could produce another gem. If I'm honest I was a bit scared because I wasn't sure she could match her debut novel. I was wrong! The Life You Left is another award winner. I LOVED it! From the start I was unable to put it down until I finished it less than 24 hours later. The story's main character is Sarah. Sarah is mother to three children, Ella, Katie and Tommy. The book opens with Sarah receiving an email from her husband Paul saying that he won't be coming home and needs some space. This comes out of the blue for Sarah and as you expect, totally devastates her. However, this isn't a story of a broken woman. Sarah, as you will find out, is an amazingly strong and wonderful woman. I was slightly nervous when I read in the synopsis about Edward. Edward is an angel that only Sarah can see. I know this can be quite divisive as to whether people believe in guardian angels, and having recently experienced a family bereavement which has led to many discussions around their existence, I wasn't sure how it may affect the books enjoyment for readers who don't believe in them. My fears were quickly allayed. Edward fits perfectly into the book. I found him very warm and comforting. His presence throughout just felt right. There is also a second plot within the book which relates to a local murder. Edward is pivotal in this story line, and it is written perfectly in my opinion. Sarah has very strong support from her twin brother James. I fell in love with him from the start and I imagine many of the readers will also. James is Sarah's rock and the depth of their closeness shines through. He is also an amazing uncle. Yes, I have a bit of a book crush on him! James is a private detective and is the only person who believes Sarah when she talks of Edward. He is amazing in his role both as Uncle but also as a private detective and I defy you not o fall in love with him too. There are a number of other characters we meet along the way, and as with Carmel's previous book I felt like I knew them all and wanted to be part of the gang by the end. Sarah's affection and desire to protect them is beautiful. Other than my crush on James I particularly loved Sarah. I found her incredibly strong, loving and determined. Many authors depict women abandoned by their husband as weak and needy. This isn't Sarah at all. I found her quite inspirational in that no matter how tough things got she never stopped caring about others and had a great drive within her. You will see that over and over within the book. I could go on forever about the book and characters but I really don't want to give the plot away and ruin it for others. The Life You Left will be long remembered by me after the final page. It has a mixture of laughs and tears, love and heartbreak. But to me the book showed that with love, friends and family even your lowest moments can be overcome. Be strong, hold you head high and believe that nothing is impossible. The Life You Left is the perfect book whatever the weather and whatever you are doing. One word of warning, clear your time because once you pick it up you won't be able to put it back down again!! Finally a word about Carmel. I don't want to gush about her, but this is only her second book and I don't know how she does it. Ok, so I do. She is an amazing author. Both this book and her debut novel Before Grace's Rainbow are in my opinion works of art. I love her ability to make me as a reader feel as though I am part of the books intimate group of friends. I love her style of writing, it for mer has such passion and intensity in the storylines that I become totally engrossed from the first page. I have come away from both books totally smitten not only by the story line but by the characters. She also evokes every emotion in me whilst reading her work. I feel happiness, pride, anger, total heartbreak at times but her books leave me inspired and feeling strong. I truly cannot wait to see what she writes next. Sarah Lawlor receives an e-mail that may change her life. Her husband has decided he needs space and has left no details as to his whereabouts or his intentions. Left to manage on her own with three young children, she contacts her twin brother, James, with the news that not only is her husband gone AWOL, but that a visitor from her past has turned up unexpectedly. When James hears the n 4.5 stars. After falling in love with Harrington's debut novel Beyond Graces Rainbow, I have been on pins waiting for this to be released. I'm ever so lucky that Carmel sent over a copy for me to read straight away. I can honestly assure you from the bottom of my heart that I have never in all my years of reading come across an author as genuine in her writing as what she is. She has such a charming, easy flow to it that it takes you into the depth of the story wholeheartedly. The Life You Left is a heartfe After falling in love with Harrington's debut novel Beyond Graces Rainbow, I have been on pins waiting for this to be released. I'm ever so lucky that Carmel sent over a copy for me to read straight away. I can honestly assure you from the bottom of my heart that I have never in all my years of reading come across an author as genuine in her writing as what she is. She has such a charming, easy flow to it that it takes you into the depth of the story wholeheartedly. The Life You Left is a heartfelt and emotional book that follows mischievous humoured and heart of gold Sarah Lawler a part-time boutique shop worker as she comes to terms with the fact that her husband Paul has up and left leaving her nothing but a few email's and a hefty chunk missing from their bank account. Even with support from Paul's darling mum Rita and hunky PI twin brother James, she's struggling not just mentally, but physically and financially too. At this point in comes childhood friend and guardian angel Edward who has been missing from her life for over twenty years. His strength and guidance allows Sarah to become stronger, but what he has to say and the gift he brings with him might possibly crumble Sarah more than anything else could. I have wanted a contemporary/chick lit book to cover spiritualism for a long time now and I was utterly thrilled to see this had a factor of that in it with Edward. In this day and age our minds are open to a lot more things out of the norm than what they used to be aren't they? I'm a very spiritual person so this book floored me completely. It's plot is thick and riveting. With a character and situation for every person to be able to connect with. It's humorous and addictive, but at the same time also incredibly sad. It is absolutely beautifully written though, and the smoothness and ease that The Life You Left reads is perfect for the plot. The only way I can describe it to you is like when you know you're stressed and you get into a hot bubble bath and you literally melt and feel your body de-stress? Well Carmel has managed to allow us to read emotional and somber situations with such grace and passion that you don't and can't twist it into something that it's not. This is exactly what a book like this needs. It's dark and it's heartbreaking, but it has a life that runs through these that makes you smile and enjoy it more. Yet again a life lesson has been given through her words and for me this not only proves what an amazing book this is, but what a discovery Carmel Harrington is to the literacy world. I know I've not written much about the whole plot and characters of TLYL, but I don't want to give even one little bit away to you. You need to go in with nothing to appreciate how magical this book is. I promise you that you will enjoy it. A heart felt tale of guardian angels, twin brothers, lies & a gift so huge that it's going to take years to open. Another breathtaking novel from the brilliant Carmel Harrington. A Pre-Order is definitely recommended. This book was (in my opinion) a big old mess. Sarah was clearly nuts. Not only did she speak to an invisible guardian angel, she acted on what he said, and then found other people who were also nuts to corroborate her story! I did think she had guts for going to speak to her husband the way she did and confronting him about what was going on, but in truth that was a necessary evil. The storyline in this was just bizarre. I expected it to be about Sarah’s husband leaving her, but it truth it was only a little bit about that, and mostly about this murder than Sarah’s guardian angel had told her to investigate! I mean really? There was romance in this, but I didn’t really like it. The ending was okay, and one part of it was probably the best part of the book. I really didn’t enjoy this book though, I found it unbelievable, and irritating, and I wouldn’t want to read another of this author’s books. I wanted to like this book. I felt bad for Sarah because her husband was a jerk and left her. I thought the fact she had an angel named Edward was interesting as was her ability to "see" things that were going to happen. I got 35% into the book (when Sarah confronts Paul ... I found their conversation annoying and badly written) and I couldn't read any more. First time I heard about Carmel Harrington was last year when I read so many fantastic reviews of her debut 'Beyond Grace's Rainbow'. I still haven't read that book, but it's on my kindle and I do hope I will be on it soon. The positive feedback from my friends/bloggers and praise of Carmel's writing were enough to get me excited about reading her books. I was beyond thrilled to be approved for this title on NetGalley and started reading it immediately. I found myself immediately drawn into it, from the opening line which is probably one of the most powerful openings I've ever found in a book. Carmel created one interesting mixture of drama and suspense with lots of paranormal and bit of romance elements. Sarah has just received the most terrifying e-mail from her husband, telling her he's leaving her and their 3 kids because he's under too much stress and needs some time by himself. A lame reason, if you ask me, especially since one of their kids is just a baby. It really made me hate him from the bottom of my heart, and made me wonder what kind of animal could do such a thing to his family? But it also got me intrigued to find out all the reasons as well as the history of Paul and Sarah's relationship. What could lead to such a thing? Was is Sarah's fault? Is Paul having an affair? WHAT? I just needed to know. However, this is not the usual drama/romance..there's also the paranormal element, since Sarah has a gift, one she's been wanting to forget all about but seems that's been thrown into her face just when she's in the hardest situation in her life. While trying to meet ends and provide for her family, she's also reconnecting with an old friend of hers, Edward who is an angel. I found the story really unique and interesting, especially since it's been a while since I've read a story with paranormal elements. I must say I hated, HATED HATED HATED Paul and despised him so much I really felt like throwing my kindle any time he would appear in the story. As for Sarah, I can't say I connected 100% with her, but I did admire her for her strength and willingness to make things right and everything she did to save her family. BUT there were also some parts which felt kind of unbelievable, and no, I don't mean the paranormal bits. It was because of those things I couldn't truly sympathize with Sarah, but they might be considered as spoilers so I will not include them in this review. I also expected this book to get more feelings out of me, however it didn't. Maybe I was not in the right mood for it, or maybe (which is more probable) I just couldn't connect to Sarah as much as I wanted. I did feel so much hate for Paul, but just couldn't feel as much love for Sarah. I also wish there was more romance, but that's just me. Overall, this was an interesting read and kind of felt like stepping out of my comfort zone. I'm definitely looking forward to reading Carmel's 'Beyond Grace's Rainbow' and once I'm done reading I can maybe compare these two books, which as I understood from friends who have read it, do differ. This book left me feeling a little bit sad and a little bit lost at the end of it. Not because it was bad. Just the opposite! It was so enjoyable that I wasn’t ready for it to be over. I loved the characters and hated saying farewell to them. I had high expectations of this book as I loved Carmel’s last book – Beyond Grace’s Rainbow – and along with those high hopes, I also had some fear. What if it just wasn’t as good. I swallowed the fears, jumped straight in a few days after the release day and by the end of chapter one those fears were firmly laid to rest. I loved it. The Life We Left has so much to offer. You have characters that are relatable and that you just want to be friends with, an Irish setting which I adore as it makes it all feel real to me, a storyline that is relevant and uplifting. As I was reading, I laughed and cried and frowned and believed. Do you know what I mean when I say I believed? I mean that I was swept away into the world that I was reading about. I wasn’t just reading about Sarah, I was Sarah. I was so into the book that I tuned out everything around me and was swept along in all that was happening in Sarah’s life. I felt the love for her children, her heartbreak over her missing husband, her fury when she realised what was happening and her peacefulness when her friend Edward was nearby. It’s also not just a contemporary book as there is a whimsical element to it. Her friend Edward is her guardian angel and I was a little afraid this would make the book twee. But it didn’t at all. It feels inspiring and hopeful and it added an extra special magical flavour to the book that I really enjoyed. And speaking of flavours, there is so many descriptions of mouth watering cupcakes in the books that I’m still craving one. Oh and there is a romance that is a little mouth watering too! Overall this is a book that has a lot to offer. I loved how it portrayed modern day relationships, family life and friendships. It gave me a happy glow just to read it and I know I’ll be revisiting it in the future. If you are looking for an escapist read; grab this book, a packet of tissues, a glass of wine and some cupcakes. Switch off, relax and enjoy! Who should read The Life We Left by Carmel Harrington? I’d highly recommend this to those who enjoy contemporary women’s fiction that feature lovable characters, strong friendships, family life and a side order of whimsy! If you like Cecilia Ahearn, Patricia Scanlan or Cathy Kelly; then this one is a must read for you. I just finished the novel “The Life You Left” by Carmel Harrington and I want to say that my mind has been blown. That may sound pretty strong, but here’s why: I have never considered myself a mystery/suspense kind of reader. This cross-genre book has me rethinking the box I’ve put myself in. Had I stuck to my own category, I would have missed this terrific read. I cracked this book open because I loved Harrington’s debut novel “Beyond Grace’s Rainbow.” At the very least, I thought, it will be w I just finished the novel “The Life You Left” by Carmel Harrington and I want to say that my mind has been blown. That may sound pretty strong, but here’s why: I have never considered myself a mystery/suspense kind of reader. This cross-genre book has me rethinking the box I’ve put myself in. Had I stuck to my own category, I would have missed this terrific read. I cracked this book open because I loved Harrington’s debut novel “Beyond Grace’s Rainbow.” At the very least, I thought, it will be well written since the first one was. I just didn’t know if I’d be able to stick with it. Right out of the gate, I was won over. What an opening. ‘Sarah, I’m not coming home tonight. As a wife and mother myself, I had to wonder what I’d do if I received such an email from my husband. I wanted to know where he was and what happened. As the story unfolded under the skilled supervision of Harrington, I was treated to watching Sarah Lawler, the protagonist, struggle with her own feelings as a rejected woman and the financial pit she was thrown into while she stayed strong for her confused children. Her humanity is three-dimensional. She’s never a saint or a martyr…she has her rage, and she drinks her wine. However, she keeps her eye on the prize and does what needs to be done. Isn’t that every woman’s story in a way? She has the support of her twin brother, James, who is a complicated character unto himself, and provides enough of the “hot factor” to please a dedicated romance and chick lit reader like myself. James is a private detective with a best friend in the Irish Gardai, and cannot help playing sleuth when a mystery presents itself. He’s Sarah’s rock, and his character helps reveal, teaspoon by teaspoon, the trauma of Sarah’s early years. Another layer to the book is the fact that Sarah has been blessed (or cursed?) with clairvoyance and other psychic gifts. She dreams, intuits, and feels beyond the five senses. And to top it all off, her best friend since childhood is Edward, a benevolent angel who functions to lead Sarah to learn and accept truths about who she authentically is as a person. When her children’s teacher is murdered, Sarah’s psychic ability kicks into overdrive, and her pull to save others from a similar fate ensnares her brother, the police detective, her mother-in-law, and the children’s kind and upstanding principal into various investigations. In my opinion, there was a real danger of going a saccharine or “pat” route with the various stories in the novel, but Harrington deftly frosts these well-known themes with a fresh icing. I read a lot, and I was pleasantly surprised by the twists this story took. I also appreciated the freshness of the voice and the uniqueness in the dialogue. Each character’s voice rang with a distinct tone. This is a solid book with a memorable story, and it crosses genres from Women’s Fiction, to Mystery, to Paranormal, to Romance. I want a sequel. Just as with Harrington’s debut novel, the characters are still with me, and the world was drawn so vividly I still have a movie of it in my head. I’m not finished hanging out with Sarah Lawler and the people who surround her. Carmel Harrington does it again! Another satisfying read. I absolutely loved the debut novel, Beyond Grace's Rainbow and when this book was released i had no doubt it was going to be another winner. And after reading it, i was completely right...it was perfect. I was drawn from the beginning...the opening sentence. Sarah's life is turned upside down when her husband Paul disappears and abandon's her with her three children ( Tommy, Katie and Ella). Poor Sarah struggles emotionally and financially Carmel Harrington does it again! Another satisfying read. I absolutely loved the debut novel, Beyond Grace's Rainbow and when this book was released i had no doubt it was going to be another winner. And after reading it, i was completely right...it was perfect. I was drawn from the beginning...the opening sentence. Sarah's life is turned upside down when her husband Paul disappears and abandon's her with her three children ( Tommy, Katie and Ella). Poor Sarah struggles emotionally and financially, things couldn't get any worse. On a good note, Sarah has a gift...she is psychic and can see her guardian angel, Edward. I loved this spiritual theme involving the story. Sarah has dreams and predictions of events which she has to work out and deal with. Sarah has a constant, her twin brother James. I really loved his character, supporting and caring to his sister and the children. They shared a strong relationship. The storyline involves a murder, Katie's teacher. The children grieve for their teacher as well as grieving for the absence of their father. Sarah yet has another of her dreams in which she see's more than she expects in this murder case. Who and what does she see? And how can she and James prove this without her sounding like a mad woman with her abilities. Sarah is a courageously strong woman and her love for her children is admirable. Edward supports her throughout her difficult times as well as being there at good times. He advises her when needed. I loved Carmel's last book Beyond Grace's Rainbow and so I saved The Life You Left for my day-long journey off to my honeymoon as I knew it would grip my attention. I wasn't wrong. I practically bit the head off the air hostess who told me I had to turn off my Kindle for descent on the second plane as I only had a few percent to go (an advert for paperbacks remaining relevant!). Without warning Sarah's husband ups and leaves her with their three young children and a whole lot of debt. This corres I loved Carmel's last book Beyond Grace's Rainbow and so I saved The Life You Left for my day-long journey off to my honeymoon as I knew it would grip my attention. I wasn't wrong. I practically bit the head off the air hostess who told me I had to turn off my Kindle for descent on the second plane as I only had a few percent to go (an advert for paperbacks remaining relevant!). Without warning Sarah's husband ups and leaves her with their three young children and a whole lot of debt. This corresponds with Sarah beginning to see the "imaginary friend" of her childhood again, her guardian angel Edward, who has not only come to help her through the trauma but to guide her as her latent spiritual gifts of precognition begin to mature and come to the fore. Sarah foresees the murder of a local woman, and afterwards continues to experience "flashbacks" and "instincts" that lead her to discover the identity of the killer (with the help of her private detective twin brother James!). The same charming, friendly flow that made Grace and her friends so real and immediate is here again in spades. This cross-genre offering is honestly gripping and thrilling - the murder mystery! - and moving - Sarah's inexplicable plight and those of the people she uses her gift to help. Another triumph from Carmel Harrington; next one please!! I take my hat of to Carmel Harrington for the genius first page in the book. I cannot imagine a single person being able to put this down after being hit with that bombshell, and it very cleverly creates a drive to read on and on. Sarah’s situation is tough to read, and no doubt very real for some people, and it gets you straight in the heart. Having never been moved to thoughts of violence by a book before, I was shocked that Paul, Sarah’s husband, evoked those kinds of feelings in me and I hone I take my hat of to Carmel Harrington for the genius first page in the book. I cannot imagine a single person being able to put this down after being hit with that bombshell, and it very cleverly creates a drive to read on and on. Sarah’s situation is tough to read, and no doubt very real for some people, and it gets you straight in the heart. Having never been moved to thoughts of violence by a book before, I was shocked that Paul, Sarah’s husband, evoked those kinds of feelings in me and I honestly wanted to punch him – I’m pretty sure this might have been the author’s intention though. In stark contrast is James, Sarah’s twin brother, who is a rock and comic relief all rolled into one, and I’m sure he’ll be a hit with most readers. The whole story had a Cecelia Ahearn feel about it that I loved. Carmel weaves some magic with her writing that is both unbelievable yet believable at the same time, creating an air of pure goodness and innocence around Sarah’s gift. Stories and characters interweave and give you an unstoppable tale of lost love, family and acceptance. There are many mysteries to solve throughout and you’ll eagerly read on in an attempt to quench your thirst for the answers only Carmel can give you and, I promise, this book will knock you for six. This is a beautifully written story which I found completely believable. And this is despite the inclusion of a character who appears to have psychic abilities as that way the story was told, it just seemed normal, as did the character of Edward who really is rather special too. I was almost in tears poolside as the book drew its conclusions and I was bereft at that it had to finish at all. An absolutely brilliant book by such an amazingly talented author. and I was hooked to Carmel and her writing she is AMAZING. I could not wait for The Life You Left I read the synopsis and I just knew it would take me away into a whole other place, and I was right it did it captured me and melted my heart. The Life You Left starts out with the main character Sarah receiving a cryptic email from her husband Paul who says he needs some time to collect himself and time away from his family,That is what she is left off with and wonders what in the heck is going on and why he would just up and leave her and there three kids Ella,Katie,and Tommy. It rocks her world to its core. I was a little torn at first and it took me a minute to get into it, but than enters Edward, Sarah's guardian angel who only she can see. Edward made the whole book come together and I quickly got into the story and couldn't put it down. Edward has a presence thru out the book,at first it was a little creepy,but than I got to know him and really liked him and what he represented. Key note is that Sarah had meet Edward as a child and it caused her to be put into a psych ward she had not seen him for 20 long years than he decides to up and appear again. Going thru so much Sarah does have support from her twin brother James. James is seriously the best supporting character I just loved him he was such a good uncle and a wonderful man. I decided that he was awesome and I developed a huge crush on him. James is a private detective and pretty much loves and believes his sister no matter what they have a bond that cant be broken. He believes Sarah about Edward and had no doubt in his sister. The Life You Left had me hanging on all the way to the end and I laughed,cried,and even was upset at some points in the book,Carmel knows how to hook you in at the right time and when to throw you for a loop.Its what makes her an amazing writer.I hope I don't have to wait long for the next book! It was the honesty in which the synopsis of this book was written that really drew me in, and I just knew that this book could really be something special. I’ve been reading a lot of young adult and new adult books recently, and was looking for an adult novel which I could read, to bring me back into the adult romance genre. I expected it to be an adjustment for me to read a book that wasn’t heavily romantic, but Carmel Harrington didn’t for one second have me thinking that I had nothing to rela It was the honesty in which the synopsis of this book was written that really drew me in, and I just knew that this book could really be something special. I’ve been reading a lot of young adult and new adult books recently, and was looking for an adult novel which I could read, to bring me back into the adult romance genre. I expected it to be an adjustment for me to read a book that wasn’t heavily romantic, but Carmel Harrington didn’t for one second have me thinking that I had nothing to relate to in the story, as she melded together so many different elements of real, and fantasy life, so flawlessly, that I just didn’t want the book to end. Sarah was quite frankly, one of the most relatable and fantastic heroines in a contemporary novel that I have ever read. Her strength just awed me from the first page, when we see the devastating shock she has when her husband leaves her and their children with only an email, no money, or assurances that he will return. She was a pillar of strength for her three children, and always put them first, refusing to sink under the pain of her husband’s abandonment and doing her best for her children, despite her heartbreak. Sarah is been put firmly on my list of all time favourite heroines, and my god, does she deserve such a title. What really set this story aside from others in its genre was the absolutely stunning writing style, and the beautiful way that Carmel Harrington depicted Sarah’s relationship with her twin brother James. She managed to pull off an amazing feat by having Sarah’s hero be her brother rather than a love interest, and I adored all the scenes they had together, as well as the scenes where we see James put his sister before the romantic conquests in his life. It was truly a beautiful, beautiful relationship, which I hope gets the credit it deserves. The added fantasy/paranormal elements of the return of Sarah’s childhood friend, her guardian angel Edward, added another extraordinary layer to the story which added suspense to the crime storyline, and a really fascinating insight into the paranormal world, something that is becoming more and more popular as a belief in the modern world. This alongside the crime storyline had me sitting on the edge of my seat in suspense and I just couldn’t stop reading until I knew what had happened. I loved the different layers of this story, and how there were a number of different characters who took centre stage at different times. Sarah’s storyline where she tries to accept the breakdown of her marriage and how her husband Paul had previously cheated on her with his new partner, was something that really had me in limbo when it came to Paul’s future, and whether I felt he deserved to find happiness and have the chance to be a father to his children after the way he left them behind with little apology. Carmel Harrington pulled this off beautifully, and really shows the true extent of her talent as an author. 5 stars and a definite recommended read. One minute Sarah Lawler is a happily married mother of three, the next she is left to juggle everything on her own as her husband Paul has decided he needs some space. Taking all their money with him, Sarah is left bewildered and alone struggling from one day to the next. She is shocked beyond belief but has three young children to look after, so battles on in the hope that Paul will return. However, as she pieces together more snippets of information, she discovers that there is more behind his One minute Sarah Lawler is a happily married mother of three, the next she is left to juggle everything on her own as her husband Paul has decided he needs some space. Taking all their money with him, Sarah is left bewildered and alone struggling from one day to the next. She is shocked beyond belief but has three young children to look after, so battles on in the hope that Paul will return. However, as she pieces together more snippets of information, she discovers that there is more behind his decision to leave than she thought. James uses his job as a private detective to woo the ladies and refuses to be tied down. However, when his twin sister’s life falls apart, he is there to step in and help pick up the pieces. He will do anything to make his sister's life easier and maybe his powers of deduction will come in handy for finding Paul. Then there is Edward who was Sarah’s childhood best friend and has only just reappeared in her life. There's only one problem: Sarah is the only one who can see him – he is an angel. The last time she mentioned Edward to anyone she was taken to an asylum, so even though she desperately needs his guidance, she is not keen on letting anyone know he is here to help. At first I wasn’t sure if I was going to like this book due to the angel element and, to be honest, I didn't like it ... I loved it! What could have been a schmaltzy yarn was actually a heartfelt, contemporary tale. Edward is not the main focus of the story – he is simply a guide for Sarah. He also opens her eyes to the fact that she has psychic abilities. I warmed to Sarah instantly and the way she found a determination in the face of adversity. Her young children were adorable and broke my heart with their innocence about what was going on with their mummy and daddy. I have mentioned before that I rarely cry while reading books, but this story had me in tears at its unexpected plot turns – especially when it affected the children. As Sarah tentatively uses her new found extrasensory skills we catch glimpses of her neighbours who are also facing troubles in their lives, too. Selflessly, despite her own problems, she strives to improve their situation and, in the process, widens her circle of friends and unexpectedly enriches her own life. By the end of the book, I was left rooting for all the friends and loved ones in Sarah’s life. You are left knowing that whatever life throws at her, she has a strong support system to help her deal with it. After having finished my first and certainly not last Carmel Harrington novel, I’m glad to say I understand and agree with all the other positive and glowing reviews about her work. ‘The Life You Left’ managed to grip me from its first few sentences until the last final stop, and in between it took me from laughter to anger to tears and back to a smile on my face. I don’t want to give too much of the story away, but the plotline is fascinating and has many different aspects to it that made it extremely captivating. There’s a mystery that needs to be solved, there’s a spiritual/paranormal aspect to the story, and next to that there’s Sarah (a strong and admirable leading lady) who is dealing with her marriage problems and a great mix of secondary characters, such as Sarah’s lovely twin brother James and her mother-in-law Rita, who also have their own issues. For Sarah Lawler, life is fairly simple. She works part-time, tends to her three young children, and runs the household while husband Paul works. Yes, it's simple, but she likes it. Simple can turn to complicated in the length of time it takes to read a three-lined note, however. Paul is gone, and there is no telling when he will return. What is Sarah supposed to do now? There are three children to take care of, and her part time job can't even pay for the groceries. Paul cleared out most of their savings, his income is gone, and that simple life Sarah had in her cozy Irish town has vanished. First, there is the matter of what became of Paul. This, actually, is dispensed with reasonably quickly. And let's just say that when you meet Paul, you will wonder what in the world drew Sarah to him in the first place. This is a question she asks herself, and while we do get an answer or two, it is insufficient. She's a kind, good-hearted woman who strove to give Paul a contented life. What did she get out of it, though? Aside from her children, what did Paul give Sarah? That's something she has to answer for herself, and she tries, just as she tries to adjust to her new normal. She is aided by some quirky locals and her mother-in-law, and she's helped out by her ability to remain optimistic in the face of dwindling hope. That's one thing you have to admire in Sarah: as quickly as her life seems to swirl down the toilet, she gamely faces her challenges. Publicly, perhaps - she does allow herself sadness and fear when she's alone - but it's what she knows her family needs. Sarah also draws strength on her spirituality. While not an overt member of the God Squad, Sarah knows there is a Higher Power, and she calls on it during her stress. This is a sweet book with its share of romance and cuteness. It's also somewhat bittersweet as Sarah faces and adjusts to the reality of her marriage. Is it too sweet? Yes, occasionally, although that isn't a weakness. Rather, the somewhat tidy resolutions of Sarah's problems is a drawback to this otherwise fine book. Read this one if you need to feel good, because that's what it does. It helps you feel a little sunshine, and sometimes that's just what we need. I liked the sound of this book when I saw it on NetGalley, but then life got in the way so it's been on my TBR list for a while now. I picked it up last night and I really got into the story. I struggled to put it down to go to bed, and then this morning I rushed home after the school run so that I could get back to my book! The prologue had me hooked - the email from Paul, Sarah's husband comes out of the blue, she didn't see it coming at all. Now she has to carry on as normal as possible for he I liked the sound of this book when I saw it on NetGalley, but then life got in the way so it's been on my TBR list for a while now. I picked it up last night and I really got into the story. I struggled to put it down to go to bed, and then this morning I rushed home after the school run so that I could get back to my book! The prologue had me hooked - the email from Paul, Sarah's husband comes out of the blue, she didn't see it coming at all. Now she has to carry on as normal as possible for her three young children. The sudden reappearance of Edward, her childhood friend who also happens to be her guardian angel brings a whole new outlook to her life and she has a lot to deal with. I was a bit unsure of where this story would go, as there is a lot going on, with the guardian angel aspect, the missing husband, Sarah's visions, and a murder to solve. Sarah takes everything remarkably well, but she is helped by the fantastic support she receives from her brother James, her mother in law Rita and her friend Ruby. Not to mention Edward, who's always there giving her the encouragement she needs when she's starting to falter. James is the only one that Sarah has told about Edward. He believed her when they were kids so when she tells him that Edward is back, he believes her now too. I loved the dialogue between the characters in the book. The story is set in Ireland, and the Irish accent came across really well, the way the characters said 'pet' 'love' and 'so' at the end of a sentence, and I loved how the kids called Sarah 'mammy or mam' (it's the northerner in me!) I could picture them and hear the Irish lilt in my head as I was reading and it really brought the characters to life. The murder part of the book felt like a bit of a side story, but even so it was still a bit thrilling as Sarah got her visions, and hoping that the murderer would get his comeuppance. It was a really touching story, and I found myself in tears at the end of the book. I really enjoyed watching Sarah flourish after the devastating start to the book. She did her best to move forward, and I loved how she confronted her wayward husband, how she remained classy and mindful of her kids when she probably just wanted to give him what for! I received this book from Netgalley from the publishers and I am SOOO glad I did!! Absolutely brilliant. This story starts with Sarah, a 30-something mom of 3 young children, receives an email from her husband that he is going through a mental breakdown and needs to get away for a while. She is beside herself, she only works a part-time job at a boutique and is busy with the kids at all times. But her husband Paul is the sole provider and since she's been married with him for 10 years, she cannot I received this book from Netgalley from the publishers and I am SOOO glad I did!! 'The Life You Left' is a charming, compelling book with a distinctive ethos. Full of memorable characters, you don't want to say goodbye to. This multi layered story melds mystery, romance, paranormal and suspense together beautifully. Paul abandons Sarah and her three small children after ten years of marriage. His communication method is cowardly and she believes he is ill but this is only the tip of the iceberg. The problems Sarah faces are realistic and her courage in facing up to her crumbling world makes her a heroine worthy of your support. The emotional trauma Paul's leaving engenders forces Sarah to accept she has an unusual gift which she uses to help those around her. She also reacquaints with two important people from her past who are instrumental in her future survival. A distinct Irish culture defines this story, which I loved. Beautifully drawn, believable characters ensure your empathy or ire depending on their role. Intricately woven with mystery and suspense providing poignant plot twists 'The Life You Left' delivers much more than you can imagine from the title or blurb and is well worth reading. 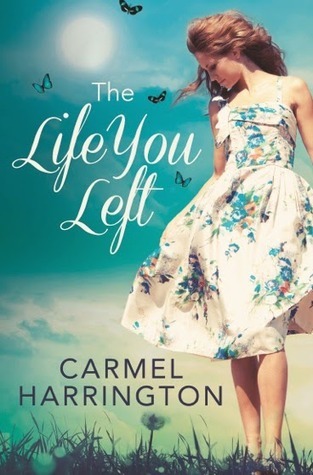 The Life You Left is the second book by Carmel Harrington that has left me reaching for the tissues more than once, so be prepared! Sarah's life is turned upside down when she finds out that, out of the blue, her husband has left her and their three young children. Left alone to try and pick up the pieces and pay the bills, Sarah finds that the childhood friend who actually is an angel that nobody else could see, and the cause of her parents admitting her to psychiatric help as a child, has come back to help her, and ultimately help Sarah to help others, too. This was such a great story, emotionally charged from the beginning, a page turner that pulls you in from the beginning. The characters were fabulous, from the lovely, sweet Sarah, to her husband who on more than one occasion I wished I could reach into the pages of the book and slap his face, the obnoxious, selfish mistress Michelle, plus a whole array more of colour personalities. Tied in with the murder story running throughout the book, along with the rest of Sarah's psychic visions kept this book rolling almost to the end at a really fast pace. That said there were a few times when I felt that there were a few pages of 'filler' information that padded the chapters out a little more than necessary, going slightly over the top on descriptive information that I found myself skimming over as none of it seemed detrimental to the story line. Without that, my review would have been a full on 5 star one. Sarah is happily married or so she thought to Paul & they've 3 young children until one day she receives an email from Paul to say that he won't be home that night which changes her life forever. Carmel develops each character so that you really feel like you know them. I love how the storyline came together, it was a busy one but never did she make me feel like I was lost. I did really want to get mad at Paul for how he picked up and left but this book had a very different approach to the s Sarah is happily married or so she thought to Paul & they've 3 young children until one day she receives an email from Paul to say that he won't be home that night which changes her life forever. Carmel develops each character so that you really feel like you know them. I love how the storyline came together, it was a busy one but never did she make me feel like I was lost. I did really want to get mad at Paul for how he picked up and left but this book had a very different approach to the subject and in the end I had shed a few tears. The Life You Left had much more of an edge to it than that with the fascinating addition of Sarah’s guardian angel Edward who only Sarah can see & hear. I loved this concept and the way it affected Sarah’s everyday life and I was always interested in Edward’s role as Sarah tried to rebuild her life and support her family. After a great start to this book, I loved how it just kept getting better. The Life You Left had everything – from family, love, protectiveness to more harder-hitting and sensitive issues. I really connected with Sarah in this novel and her wonderful and strong personality. If you are looking for an escapist read; grab this book, a packet of tissues, a glass of wine and some cupcakes. Switch off, relax and enjoy! I really enjoyed Carmel's second book. It kept me turning the pages to the end. Good mix of mystery and romance & I think all of us can say we've a guardian angel looking over us or have done at some stage in life as I know I have. Right where do I start, so much going on in one book !! so much emotion.....so much of an amazing story !! Carmel Harrington does not disappoint (yet again!) on this new book of hers. She is an amazing story teller and manages to weave so much emotion and love and personal touches into her writing. I feel there is so much of her in there too......you see I am lucky enough to actually know her personally ! But that's not the reason for the 5 star review, and when you read it yourself you will see Right where do I start, so much going on in one book !! so much emotion.....so much of an amazing story !! Carmel Harrington does not disappoint (yet again!) on this new book of hers. She is an amazing story teller and manages to weave so much emotion and love and personal touches into her writing. I feel there is so much of her in there too......you see I am lucky enough to actually know her personally ! But that's not the reason for the 5 star review, and when you read it yourself you will see why. Her insights into families / personal relationships / life in general are just wonderful and so true to life. Having been through a marriage breakup myself I felt like I was living some of the feelings / emotions in this book. I don't want to give too much away to anyone reading this review in the hope of an insight into what this story is about, but just know that I found it hard to put this book down and I had a busy weekend where I was just RAGING that I didn't have enough time to sit and just read !! I wanted to be back "in" the book and find out what happened to all the characters. Thank you Carmel Harrington for your wonderful writing and insight into life and also what it means to have a guardian angel. Its wonderfully written and you find yourself wishing you had your own "Edward" in life to guide you through life's ups and downs. When Sarah's husband Paul sends her an email saying he isn't coming home for the foreseeable future, she has to pick up the pieces of her life and carry on for the sake of their three children. Luckily for her, Sarah has a very supportive twin brother James, and a guardian angel Edward that she can see and communicate with. While this upheaval occurs in her life, she also begins to have vision and premonitions that lead her to believe she may hold the key to doing a local murder case. The fact t When Sarah's husband Paul sends her an email saying he isn't coming home for the foreseeable future, she has to pick up the pieces of her life and carry on for the sake of their three children. Luckily for her, Sarah has a very supportive twin brother James, and a guardian angel Edward that she can see and communicate with. While this upheaval occurs in her life, she also begins to have vision and premonitions that lead her to believe she may hold the key to doing a local murder case. The fact that Sarah's husband has just left her, supposedly after having a breakdown, would in itself be a good story, but add to that the guardian angel/psychic element and you have a very intriguing plot. I liked Sarah, she was easy to empathise with and she was a great mother to her kids. I also really liked her brother James, he was a very strong character and one who I would like to read more about. However there were also some negatives that I couldn't overlook. Some of the language used was very repetitive, there was an overuse of affectionate terms I felt also. Some of the dialogue was quite stilted and not at all realistic, particularly the scene where Sarah confronts Paul about leaving her. Early this year I read Carmel's debut novel, Beyond Grace's Rainbow, and I loved it. So I was very excited when I was approved on Netgalley for her second book, The Life You Left. I started it with great expectations but it took me a while to get into the story of Sarah. Sarah has been abandoned by her husband and is struggling both emotionally and financially with her three kids. And to top it all, she is seeing her guardian angel again, something she cannot tell her loved ones in fear that they might think she is crazy. The plot is very unique and I enjoyed the mistery surrounding Sarah's dreams and visions. Plus, I really liked James, Sarah's twin brother, and how he worked closely with Sarah to try to solve the misteries. As I said though, it took me a while to get into the story because there were some things that weren't adding up to me. I think that I found it hard to believe that everyone was either extremely nice, like Sarah's kids or the postman, or extremely rude, like Paul's new friend. But all in all, I enjoyed the book and was very intrigued by it. It surprised me by the end and had a couple of great evening reading it. I'll be sure to keep an eye on Carmel's future books because she has a special way with words. Take the warmth and wit of Maeve Binchy and the secrets and twists of a Liane Moriarty and you get the utterly original and compelling voice of Irish Times bestseller Carmel Harrington, a voice that has captured the hearts of readers around the world. Carmel is from Co. Wexford, Ireland, where she lives with her husband Roger and two children, Amelia and Nate. Carmel writes with incredible compassi Take the warmth and wit of Maeve Binchy and the secrets and twists of a Liane Moriarty and you get the utterly original and compelling voice of Irish Times bestseller Carmel Harrington, a voice that has captured the hearts of readers around the world. Carmel writes with incredible compassion and warmth about characters so authentic, they could be sitting right beside you. Her page-turning family-centric novels are translated into eight different languages, all regular chart-toppers. Books published in 2017 are The Woman at 72 Derry Lane (Harper Collins) and Cold Feet - The Lost Years (Hodder & Stoughton). This original novel is written in collaboration with Mike Bullen, the creator of the popular ITV show. Carmel is a regular on Irish TV as a panelist on TV3’s Elaine Show. In addition, she is Chair of Wexford Literary Festival, of which she co-founded. Her other bestsellers include The Things I Should Have Told You, which was shortlisted for a BGE Irish Book Award in 2016, Every Time A Bell Rings, The Life You Left and Romantic eBook of the Year 2013 & Kindle Book of the Year 2013 winner Beyond Grace’s Rainbow.